The Green Slim series boasts an industry-leading 2x optical zoom lense making it the perfect choice for those looking to upgrade their existing installed projectors, this means that a Green Slim model will replace any installed projector seamlessly without having to change the ceiling brackets. This will help to keep l budgets under control and disruption to a minimum. The Green Slim series offers brightness levels up to 3000 ANSI lumens more than enough for even a large bright meeting room and with a choice of XGA & WXGA resolutions with or without wireless connectivity the Green Slim Range has allot to offer . All models have Video, VGA and HDMI connectivity enabling the presentation of HD content through a digital connection, they are light and portable so can easily be moved between rooms if required or used as a portable projector. By combining a laser, a fluorescent element and an LED Casio has created an original mercury-free hybrid light source* capable of generating high brightness. Casio has achieved high brightness output of green light, which until now, has been considered difficult with conventional semiconductor light sources, by efficiently converting blue laser light into green light using a fluorescent element. Provides 10X longer light source life than Casio mercury lamp while being more economical based on lamp replacement. The Slim projector features quick startup and shutdown. The projector reaches its maximum brightness in a minimum of 8 seconds and requires no cooling down period - an advantage for keeping presentations focused and smooth. 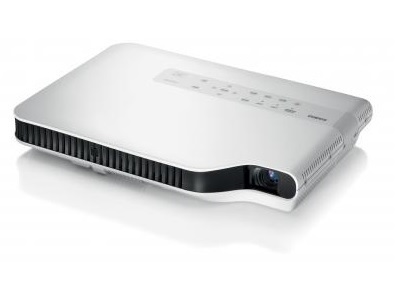 The Slim projector delivers a 50 percent increase in color spectrum for high impact presentations due to improvements in LED and laser technology. Superior color reproduction enhances color purity allowing visual effects to appear brighter and offering powerful images that conventional projectors cannot match. Compared with conventional high-brightness projectors employing mercury lamps, Slim technology cuts costs as well as the time and effort involved in lamp exchange while maintain clear, high-quality images over an extended period. The LampFree® design is backed by a comprehensive 3 year warranty including the light source; users can expect reliable worry free operation from the Slim projectors. Whether you are in a small office or a large boardroom the 2X power zoom lens gives you the flexibility to easily position the projector. The Automatic Brightness Adjustment, which adjusts lumen output based on the level of ambient light in the room, saves power, which saves money and saves you from eye strain as well. A built-in HDMI (High Definition Multimedia Interface) input provides a direct digital input and allows connectivity with many Widescreen Notebooks now shipping with HDMI outputs. Compatible with HD Video formats, HD Video sources including Blu-Ray players, cable converter boxes and gaming systems can be connected to the Slim projector.